Staring at a bright monitor screen late into the night is not recommended for several reasons. The lack of ambient lighting increases eye strain, and the largely white-blue light emitted by your display can disrupt your sleep pattern. 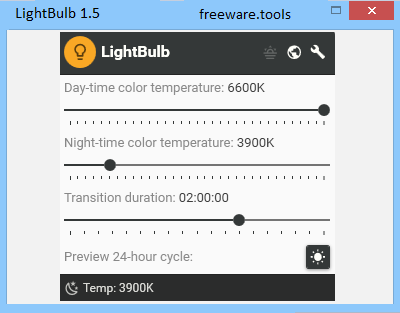 LightBulb is a lightweight, open-source application that offers comes with an interesting solution: instead of altering your monitor’s brightness, it adjusts its gamma based on the time of day, reducing color temperature as the sun sets. The program offers several customization options, and it is a great choice for gamers thanks to its fullscreen mode. This tool adjusts your monitor's gamma automatically to reduce eye strain and help normalize sleeping patterns. It has been widely theorized that limiting the amount of blue light your monitor emits can make it easier to fall asleep when you finally hit the sack. While concrete scientific proof is not available, there is no question that warmer light is much easier on the eyes, especially if your room is particularly dark. LightBulb adjusts the color temperature of the light emitted by your display, anywhere from 3400K to 6600K. You only need to enter the limits and set the transition duration, as the application performs these adjustments automatically based on the sunrise and sunset time info that is available. By default, the sunrise and sunset times are set automatically based on your location, which is determined using a geolocation API. However, you can also disable this function and set these parameters manually. Gamma polling can also be disabled at any time if you wish to prevent the application from regularly refreshing gamma. This operation is normally performed every five seconds. We found the preview function to be especially helpful, as it enables you to simulate an entire 24-hour cycle in just a few seconds, making it much easier to fine-tune your settings. LightBulb can be accessed from the system tray after installation, should you wish to customize the settings or disable its functionality for a certain amount of time. A feature that gamers should be very happy with is the optional fullscreen mode; when enabled, the app resets your monitor’s color settings to default if a fullscreen application is in the foreground. There are several programs you can choose from that provide similar functionality, but LightBulb is one of the best, as it offers a balanced set of features and packs them into a small, user-friendly package. Gamers should most definitely try it out, as it allows them to reduce eye strain without negatively affecting in-game graphics quality.